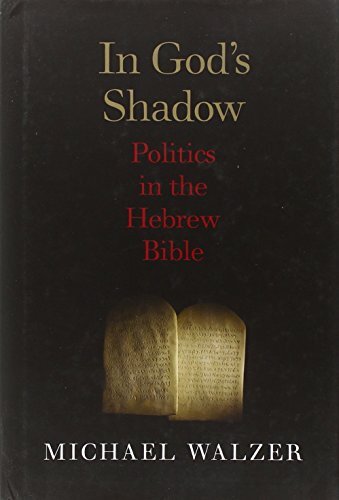 This is the question Michael Walzer tries to answer in his book In God’s Shadow, the product of decades’ discussions with members of his minyan at the Princeton University’s Center for Jewish Life and of a series of courses on biblical politics held at various universities in New York and Jerusalem. Politics is about law and government and the role of human agency. As a religious text the Bible’s task is not political. Biblical writers, argues Michael Walzer, “are engaged with politics, but they are . . . not very political,” the exception being law. However, much of what they say, how they say it and when, is “politically interesting” in that it throws light on how an ancient people adapted its self-organization and sense of identity in the face of external and internal threats. When during the Exile to Babylonia it dawned on Israelites that an own kingdom and homeland (the equivalent in modern political language of a nation-state) was beyond reach, at least for a certain time, they began to place an emphasis on the written record, and it was thus they were transformed into Jews relying on non-state institutions such as synagogues, courts and councils, for maintaining and passing on their legends, traditions and moral teachings. This perhaps is also what explains the most striking political feature of the Bible, namely its pluralist nature. Unlike other religions which sought to replace, rewrite, or harmonize their various traditions, all survive in Judaism. Hence the latent argumentative style of the Bible—latent insofar as there is no record as such of a debate. Still, the co-existence of different traditions suggests this must have taken place diachronically if not in real time. • The co-existence of the covenant of the flesh and that of the law to justify the foundation of the people of Israel: whereas the former is family-based, solidaric, and exclusive, the latter is based on faith, inclusive, and punitive. Already in the early days of Israel the two traditions were apparently often in conflict when deciding issues regarding intermarriage, conversion or sectarianism—and they remain still today. • The reliance on three legal codes on rules and conduct. Insofar as they covering different life domains, these are for the most part complementary, but occasionally they are at variance, for instance, on the subject of slavery. • There are two narratives on war—that of herem which is equivalent to holy war and allows destruction and genocide; and that of the limited war doctrine which is guided by constraint, also in order to protect civilians. • The emergence of individual responsibility to complement the more dominant and fearful regime of collective responsibility and suffering. • The juxtaposition of “messianism in the narrow sense” to the possibility of redemption without a King / Messiah. Additionally Michael Walzer’s book provides an overview of the functions of different elites, such as kings, priests, prophets, wise men, scribes and the elders. The image that emerges out of these descriptions is that of a society to a significant degree regimented, albeit allowing contestation in the name of God, mostly in hindsight, sometimes in foresight. Still, it would be too extravagant to consider the Bible as containing the promise of a democratic political culture. In God’s Shadow is an interesting scholarly book on a challenging topic. Its main achievement is that of showing how even God’s word is never absolute even if unambiguous in particular settings. The book would have benefited from a comparison with other religions; and also from some reflection as to how the Bible’s pluralism is impacting on the political life of modern secular nations with strong religious communities. These might, however, be a subject for a new book. Liana Giorgi, Ph.D., is a freelance social science research and policy consultant. Previously, she was Vice-Director at The Interdisciplinary Centre for Comparative Research in the Social Sciences, with diverse expertise in sociology, political science, public policy, and ethics of research. Dr. Giorgi was also editor of Innovation: The European Journal of Social Science Research. She is the author of numerous books, articles, and professional research reports. Her most recent book, co-authored, is Festivals and the Cultural Public Sphere.